The Rev. Dr. Robert Gormbley grew up in the Congregational tradition in Massachusetts and Connecticut. He was ordained, in 1980, in his home church, the Wilton Congregational Church in Wilton, CT and began his ministry in First Church, UCC, Manchester, New Hampshire. He has since served United Church of Christ congregations in Charlotte, Vermont, Milford, East Longmeadow, and West Springfield, Massachusetts. After 35 years in the full time settled ministry, his call lead him to interim ministry. He recently completed a 2 yr. 8 month transitional interim ministry at the First Church of Monson. He earned his Bachelors in Philosophy at St. Olaf College, in Northfield, Minnesota, a Masters in Divinity and a Doctorate with Honors from Andover NewtonTheological School in Newton Centre, Massachusetts. Pastor Rob began his interim ministry with us this past November. In addition to leading Sunday morning worship, he will be facilitating our Time of Transition ministry beginning in February in preparation for beginning our search for our next settled pastor. We welcome our summer worship leaders and hope you can join us! ​ at the First Congregational Church of Lebanon, Connecticut. Rev. 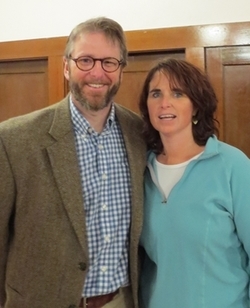 Will Sencabaugh was pastor of the First Congregational Church of Shelburne from August, 2011, through May, 2018. ​ Rev. Will earned his Masters of Divinity degree from Bangor Theological School in 1998, and a Doctor of Ministry degree from the Andover Newton Theological School in 2002. He began his ministry serving as a student pastor in Carmel, Maine for two years while still attending seminary. He has also served churches in Halifax, South Deerfield, and a church on the south coast.